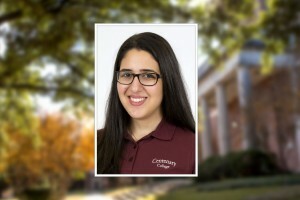 SHREVEPORT, LA — Centenary junior Sabrina Handal has been awarded a scholarship from the Order of Omega, a leadership honor society for members of fraternity and sorority organizations. Handal is a member of Centenary’s Iota Gamma chapter of Chi Omega. Order of Omega recognizes juniors and seniors who have exemplified high standards in scholarship, leadership, involvement with Greek organizations on campus, and service to the local community. Members are selected from the top 3% of students at each institution and must have a GPA that is above the average Greek GPA on their campus. Kimberly Davis is an assistant director of residence life at Centenary and serves as an advisor to the College’s Panhellenic Council. After Handal was initiated into Centenary’s chapter of Order of Omega in spring 2017, Davis immediately identified her as a potential scholarship contender. Handal is an international student from Honduras pursuing a Bachelor of Arts in communications with a double concentration in Film/TV/Video and new media. She is also minoring in Spanish. In addition to her work in Residence Life and Greek life, Handal serves as public relations head for the Centenary Activities Board and president of the Centenary Film Society. She has worked for the College’s newspaper, radio station, and marketing and communication team and has also served as a Student Ambassador for the Office of Admission. She recently joined the staff for Pandora Student Design, a student graphic design team at the College.